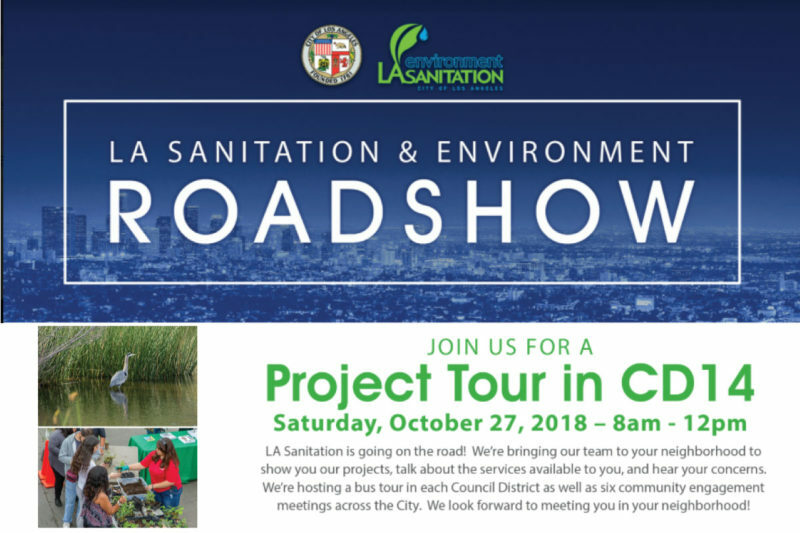 The City of Los Angeles’ Bureau of Sanitation is going on tour this year, and on Saturday, October 27, they are bringing their team to the 14th Council District. The events starts at 8 am. Neighborhood Council members are especially invited to this event, but it is open to the public. The Bureau of Sanitation will show you their projects, talk about their services and programs and hear your concerns. You will learn more about solid refuse management, air treatment facilities, water reclamation plants, SAFE Centers, educational facilities, storm water projects, and more. The event starts with everyone meeting at their C.L.A.R.T.S facility at 2201 E Washington Blvd., Los Angeles, CA 90021. There, you will learn about solid refuse management. Then, you will get on a bus and visit Hollenbeck Park (a floating wetlands), located at 415 S. St Louis Street, Los Angeles, CA 90033. Finally, the tour concludes at Garvanza Park, located at 3250 Meridian Street, Los Angeles, CA 90042. The Bureau of Sanitation expects to have everyone back at the C.L.A.R.T.S. facility at about 12 pm. Note: This is a great opportunity for the Public Works Liaison for your Neighborhood Council, but of course anyone from your Neighborhood Council can attend, and it is open to the public. Click here to view and download a printable flyer with more details. To RSVP, or for more information, please call (213) 279-3311 OR e-mail LASANroadshow@lacity.org.